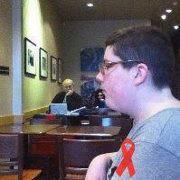 Hi, i’m Luke Sam Sowden, and welcome to my blog. As i’ve already said, i’m Luke, i’m a visually impaired guy, well technically i’m classed as being severely partially sighted, who lives in the north of England, who likes to ramble about everything and everything all over the internet. I also use a white cane, so if you ever see a picture of me with something strange attached to my wrist, don’t worry, it’s just my big old white stick, hah! I would put my blog squarely in the category of lifestyle. From health and Beauty to Food and drink, and from Fashion to things that happen because i’m visually impaired, there’s a little bit of everything. What Makes You Visually Impaired? I suffer from a hereditary eye condition known as Retinitis Pigmentosa, or RP for short. This means I also suffer from tunnel vision, and night blindness, but if you would like to know exactly how I see, read my How I See post. I mainly started blogging because of my YouTube Channel. I mean I love creating new videos, but blogging is much easier, and it takes up a lot less of my time. Creating videos is a lot of work, but with my blog I can sit down and write a new post in about 20 minutes. Also, I find writing extremely relaxing, plus if I get a post idea, I can write it on the go with my phone. Why Did You Start Your Channel? I started because of Chris Pirillo and Tommy Edison. It looked fun, and if they could do it, why couldn’t I? I mainly post favourites, hauls, and tags over there, but I love doing it, and it’s loads of fun. I hope that answers any questions you may have about my blog, but if you have any others, just ask.